Fatboy Slim has announced that he will be taking his hugely immersive In the Round Show to cities across the UK in February and March 2019 including a date at the Manchester Arena. Fatboy Slim is aiming to create the UK’s biggest dance floors turning our favourite arenas into unique night club experiences. Imagine something unusual and completely different. Expect a big production, a revolving stage, rave ushers and a live smiley face experience. No seat in the house will ever far away from the stage. 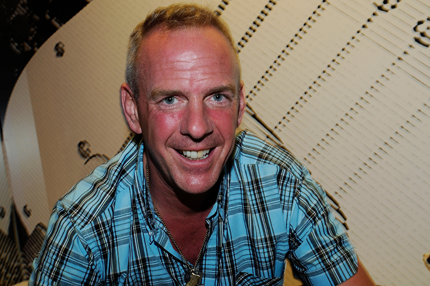 Fatboy Slim established his particular flavour of In The Round experience at The O2, London and Glasgow SSE Hydro at the end of 2016, in his usual relentless pursuit of fun. Already making records, this will be the biggest capacity DJ event to ever be held at The SSE Arena, Wembley and it will be the largest dance floor ever created at Birmingham Arena. Its 20 years since ‘You’ve Come A long Way Baby’, 17 years since the infamous Big Beach Brighton, 6 weeks since he played 162 meters above Brighton in the i360 pod, two weeks since El Row Olympic Park London and now its five months until Norman Cook brings the best party he can to the far reaches of this fair land! Tickets go on sale FRIDAY 7TH SEPTEMBER 10AM at www.gigsandtours.com / www.ticketmaster.co.uk.